Cool! I'm going to try to stop buy and bring a friend. I just wanted to let you know of a cool event I'm producing in Santa Rosa, CA. It's the Great Hand-Car Regatta and Exposition of Mechanical and Artistic Wonders. We will be having a mid-size Steam Trunk Craft Show and still have a few openings for local crafters who would like to come and sell their fine wares. Hope some of you can make it!!! 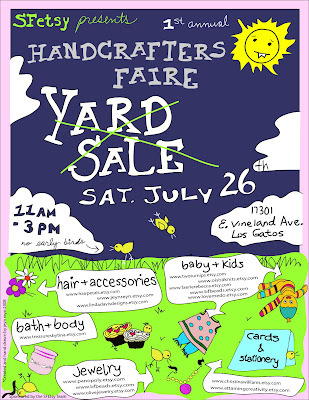 have a happy yard sale! Hey there! I'm moving to Oakland next month to transfer to Patten University.. I currently live near Placerville. Anyway I just opened my shop and I heard about Etsy Teams.. I know nothing about teams but was wondering what was required to join this one! I'd love to learn more about teams :) thanks!